Levenshulme’s festival of arts and culture, 4th to 14th July 2019. Keep up to date on our Fringe page. 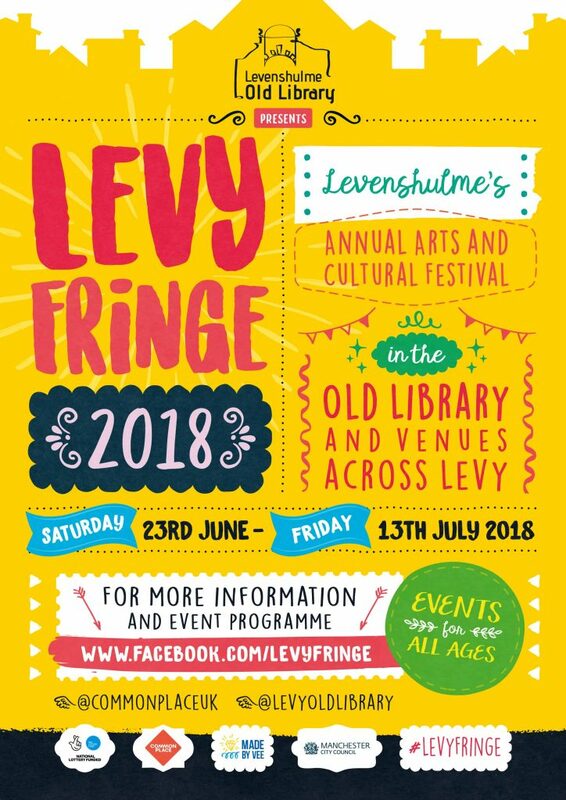 Follow Levy Fringe on Facebook for updates on events, which will be happening throughout Levenshulme. This year’s Levy Fringe will be delivered in partnership with Arts Council England. 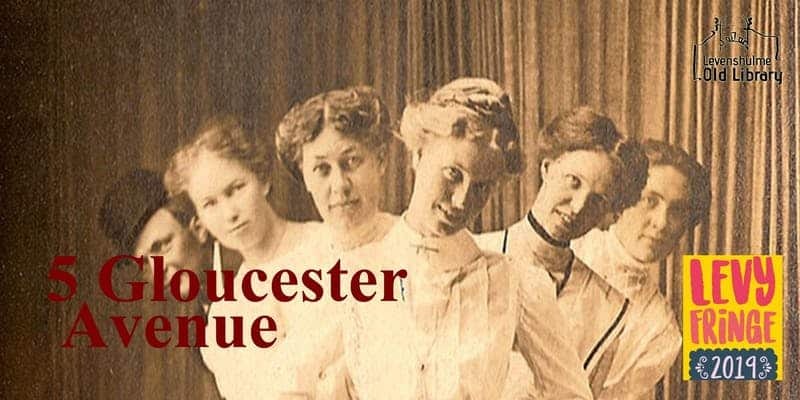 Friday 15th March at 7.30 p.m.
Saturday 16th March at 3 p.m. and 7.30 p.m.
A promenade theatre production at 5 Gloucester Avenue, M19 3WT of five short plays inspired by the people who lived there and what might have happened to them. 5 Gloucester Avenue is a promenade theatre production involving 5 short plays. We take the audience around five rooms in the house including the garden! Each play is inspired by the people who have lived in the house since 1901 and what may have happened to to them. Book your ticket now as there are limited spaces available. Without our sponsors and supporters we couldn’t do what we’re doing at Levenshulme Old Library. The CIO, occupants, users and friends are truly in awe of our supporters for helping us every step of the way on a long journey. One Manchester have given us exceptional support from day one. MCC from the neighbourhoods team, to the council, to the town hall, thank you. Manchester Community Central have been utterly priceless, fantastic. If you would like to support us please email us by clicking here or use the form on our contact page (click here). This year it will run over 3 weeks from the 23rd June to the 13th July 2018, in the Old Library and in the broader Levenshulme community. Some details of forthcoming events are avaialable here on Facebook with a full consolidated programme coming soon. There’s information about how to get involved in this Facebook group. Or contact us through our Contact Us page. Here is a short soundless video clip showing problem that caused us to have to postpone our Reopening Celebration. This is the East facing (Bluebell) side, at the back in front of the bay window near the accessible loo. The arch is very shallow and it’s started to give way. The cracks have been there a while but the issue has accelerated just recently. It’s now safely propped and in new year a steel beam will be inserted over the arch to span the full width of it, plus some, to take the weight off it. We are hoping that very shortly this crack will be repaired! Fri 23rd Feb, 4pm – 6pm. The Levenshulme Old Library team are delighted, finally, to be able to open the doors of the old library to you, our surrounding community. Doors will be open at 4pm, from 4.30 we’ll have music from the Jazz Biscuits, there’ll be opportunities to chat to our library tenants All FM, to Levenshulme Youth Project and to mindful art therapists from The Owl And The Coconut who are also planning to make the library building their home. At approximately 5pm MP for Levenshulme and Gorton, Mr Afzal Khan, will deliver a message of congratulations and solidarity to the many people in our community that have fought for three long years, organised and worked hard to secure our old library building for use by our community again as a valuable and highly valued community facility. From 6pm the merriment will continue next door in the Bluebell. Whilst there’s some way to go before the library is fully functioning as an Art Centre, we’re very happy to be able to open our doors and invite people inside to once again experience the unique ambiance of this fabulous space and to celebrate the end of a long road that sees us now able to invite you all in. The event will be a final opportunity to win this fabulous reading chair by Decourcey Designs of Levenshulme Antique Village and announcement of the winner. 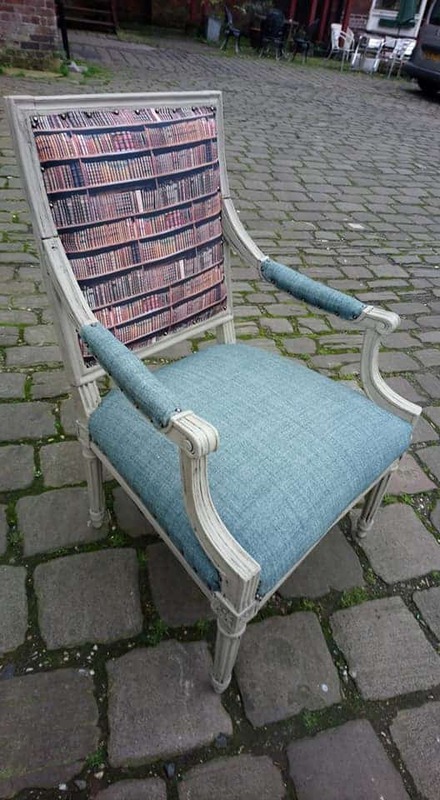 This gorgeous reading chair has been delightfully upcycled and tastefully reupholstered reflecting not only the joy it might bring to a keen reader, the book-shelf print fabric is appropriate also because Sharlene has very kindly donated the chair to raise funds for the library. Our Reopening Celebration will be the final opportunity to submit a sealed bid for it. The winner will be announced on the night at the library. Do come, bring your families, and join us for this celebration of a triumph against the odds for our community. A structural repair needs to happen without delay and this work will render the environment unsuitable for public access. This in no way affects our broader plans for the library at all, we’re simply not willing to take risks when it comes to the safety of the people in the library. We apologise sincerely for the inconvenience this may cause and look forward to rescheduling the event and wlecoming you all into the old library in the new year. For the first time in almost two years we’ll be opening the doors of Levenshulme’s Old Library building to the general public once again. With a congratulatory message from Levenshulme and Gorton’s MP Afzal Khan, we’re inviting everybody to come together inside our library building and enjoy a light-hearted celebration of it’s return to use as a valuable community asset. There will be live lounge music from the Jazz Biscuits and a special sketch for the occasion performed by the Levenshulme Players – this is set to be a joyful event. Bring your families and if you feel inclined join us in the Blue Bell (next door) for further merriment from 7.30pm. Sat 18th Nov at the Klondyke, 1 Burnage Range, Levenshulme, 8pm til late. The Old Library team will be answering any questions after a full project update, then at about 9pm our fabulous friends from Leve Nights will host a party for us. Join us and dance the night away to a wide variety of music spanning across genres. We’ve got loads of great prizes to raffle off that have been kindly donated by local businesses: two pairs of tickets to events in December at Fred’s Ale House; a fabulous chair from Decourcey Designs in the Antique Centre; a pair of tickets to Levenshulme Players‘ Xmas Revue including a meal for two; the Bluebell in Levenshulme serves a legendary traditional Sunday dinners, two of them; and a £20 discount off a meal for two at AlBorz fabulous Persian restaurant. If you or your business would like to help the library by providing a prize for the draw we’d be exceptionally grateful for your help: please click here to contact us. 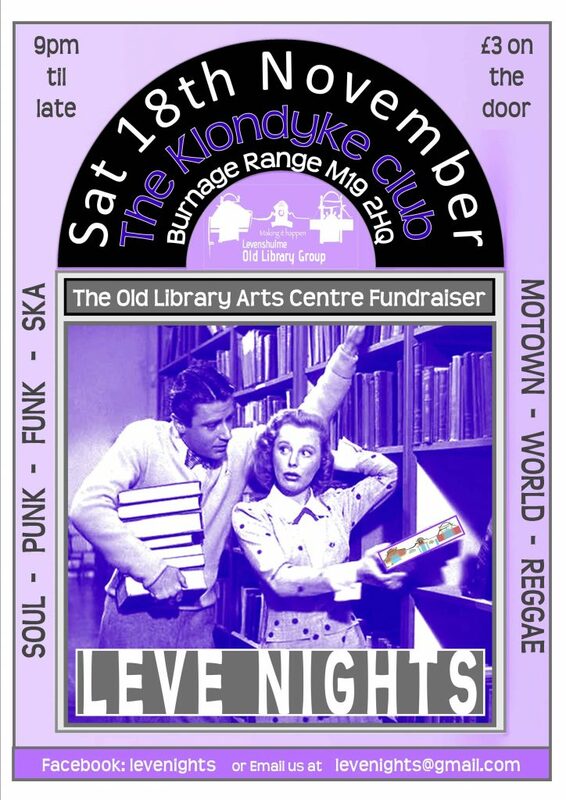 Put on your dancing shoes, bring some friends and have a fabulous time with proceeds going to our old library funds. 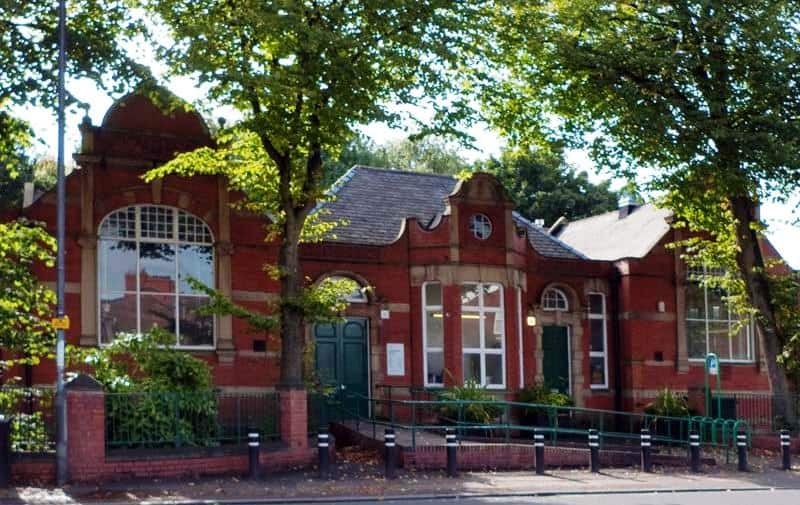 Levenshulme Old Library CIO takes on responsibility for Levenshulme Old Library. 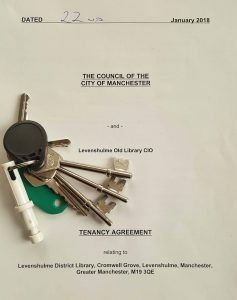 At 10.30 hrs this morning 22nd January 2018, following three years of campaigning, planning, community self-organising and cooperative working, Levenshulme Old Library Charitable Incorporated Organisation signed a lease agreement with Manchester City Council. Congratulations and well done to everybody in Levenshulme that’s supported the take over project and got it to this point, you now have an art centre. We are taking over Levenshulme’s Carnegie Library, on Cromwell Grove, and transforming it into an arts, community and culture centre for the communities of Levenshulme and the surrounding areas.